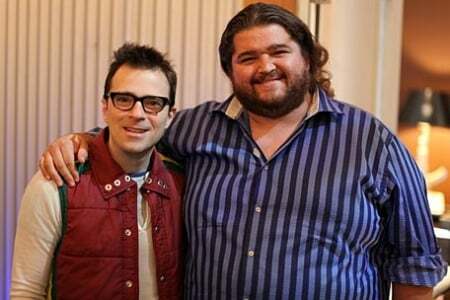 Lost may be over, but the show lives on in the hearts of fans-- including, apparently, the band Weezer. The group known for giving names to their albums only reluctantly-- three have been self-titled and are known as "The Green Album," "The Blue Album" and "The Red Album"-- was struggling once again to come up with a name for their latest effort before they settled on something kind of unexpected: Hurley. And in case you thought it was a coincidence, take a look at the image above. That's Jorge Garcia's face taking up the entire album cover. Amazing. "We struggled super hard trying to come up with an album title, trying to find some kind of phrase that summed up the whole aesthetic behind the album: 'Heavy Mental,' 'Smaller Than Life." I was coming up with all kinds of stuff, but ultimately, we just went with some random word that doesn't really have anything to do with anything. I just loved this photo of Jorge Garcia -- it just had this amazing vibe. We didn't want to do a fourth self-titled record and we knew people would refer to it as 'the Hurley record' even if left it without that title, so we just called it 'Hurley.' No words are on the cover because all we wanted was his amazing face." Best of all, the album image is taken from a photo Cuomo took with Garcia when the two met earlier this year. Cuomo hasn't even watched all of Lost-- he's only up to season two, so don't spoil anything!-- but he says he really likes the show. Check out the original photo below, and Lost fans, just accept the fact that you're going to have to buy this album now, whether you like Weezer or not.